In recognition of World Vegetarian Day, we’ve been poring over our collection of cookbooks looking for the best in animal-friendly, heart healthy recipes. Our undisputed favorite was this collection of 150 sumptuous vegan meals from acclaimed food justice activist and “eco-chef” Bryant Terry. Bryant Terry takes local, organic, vegan cuisine, gives it a Southern twist and a much needed dollop of soul. It wasn’t enough to provide us with soon-to-be-family-favorites like upper Caribbean creamy grits with roasted plantain pieces, Terry gives us a soundtrack as well. Each of these mouthwatering recipes comes with a recommendation for musical inspiration ranging from old-school soul to gospel to hip-hop. Terry’s background in food justice activism leads him to eschew elitism; his recipes depend on commonly available ingredients without sacrificing quality. Don’t let the “vegan” label scare you; this is a book for all of us who know that “healthy” and “hearty” are not mutually exclusive. Entry filed under: Book Specials. 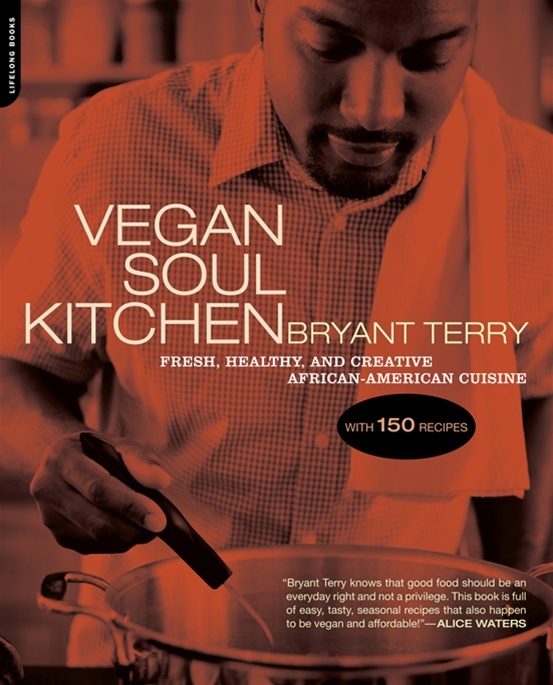 Tags: barbecue, bryant terry, cookbook, cooking, food justice, gospel, health, hip-hop, local, music, organic, r and b, recipes, rhythm and blues, soul food, vegan, vegetables, vegetarian.